Have you heard the expression “A goal without a plan is just a wish”? While I don’t wholly agree with the sentiment I do think it serves as a great reminder that in order to reach our goals we have to take them time to plan them out. 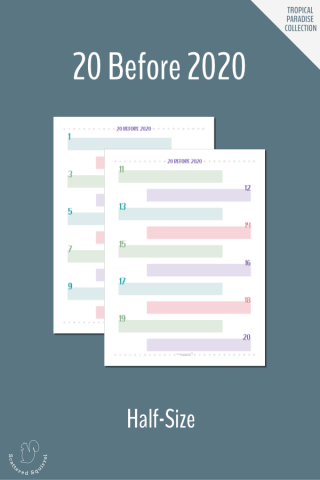 Today I’m sharing a few printables to help you plan your goals so you can turn those wishes into dreams come true. Taking the time to plan your goals allows you really focus on what you need to do to reach them. Life is full of distractions. It’s fluid and always changing. We go through different seasons and our needs, desires, and priorities shift and change. Our family’s needs, desires, and priorities shift and change as well. Emergencies crop up or the unexpected happens, such as a new job, moving to a new town, buying a home, health issues, and new additions to our family. It’s easy to overlook or set aside our goals when we’re caught in this ebb and flow. That’s why taking the time to plan them is so important. It gives us a road map to follow, even when life gets crazy. I didn’t use to take the time to plan goals. I used to write them down and I tried to be as detailed as possible. Actually taking the time to plan them out step by step? Nope. It sounded like too much work and I just wanted to get started. It was enough to write them down right? Wrong! It’s so much easier to reach a goal you set if you have a plan for how you’re going to get there. Taking the time to plan your goals doesn’t have to be a huge time commitment. Just like most things, the more you do it the easier it becomes. If you use the same system each time you start to find a rhythm to the planning process. The goal planning worksheets below were designed to help make the process of planning your goals smooth and easy. 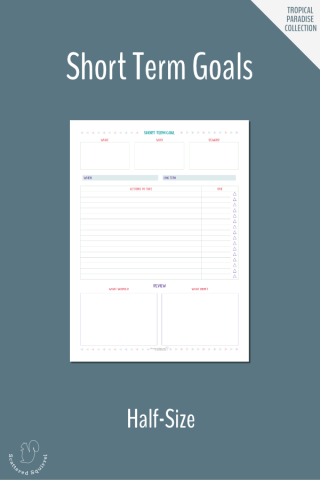 To download the printables, simply click the image of the one you would like. I like to start with my long term or big goals. These are the goals that are going to take the most time commitment from me, or are the ones that are set in the future. These are examples of long term goals. They take time, both in how much we spend to reach them and how long it will take us to meet them. I start with these ones because I find that there are usually smaller, or shorter term goals that I need to make to help me reach the big ones. These long term goal planning worksheets are laid out to make planning your goals super easy. Across the top, there are three boxes. The first is your what box. This is where you write down what your goal is. The next is your why box. Knowing why you want to reach a certain goal helps define it a little more and solidifies its purpose. The last is your reward box. You can either assign an actual reward you are going to give yourself like a new desk for you office. Or you can use this box to describe the rewards of reaching your goal, like a better pay cheque or a kitchen that is set up exactly how you need it. These boxes are followed by a place to set your deadline and then outline how you will reach this goal. You can assign a due date to each action step and there is a checkbox where you can check off your progress. The final section is for reviewing your goal. What parts of your plan worked? What parts didn’t? Make notes about that in this section and then refer to them the next time you’re planning a big goal so you can try to avoid the things that didn’t work. Short term goals, for me, are any goals that will take less than six months to achieve. They might be steps towards reaching a larger, long term goal or they might be stand alone goals that are not part of a bigger picture. 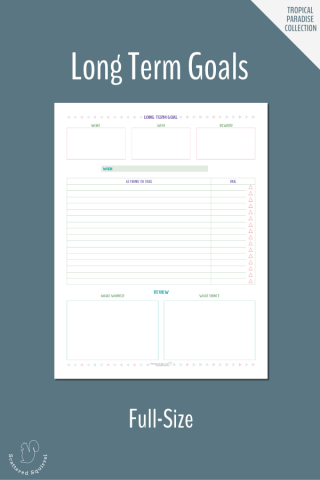 These short term goal worksheets are set up the same as the long term ones. With one addition. Under the top three boxes I added a space to note if the goal is part of a long term goal. I find it helpful to be able to quickly reference the long term goal if needed and it’s always nice to remember that we’re working towards reaching something bigger. Especially during those times when we feel discouraged. There are always goals that don’t need to be planned in detail. At least, maybe not right away. A goal like organizing your file cabinet or starting a scrapbook. Goals that have steps that need to be taken, but maybe you don’t really need to write them down. Or maybe you like to make list of things you’d like to do this year, but you don’t want to actually plan them all out? That’s where the 20 Before 20 List comes in. This printable could be used in so many different ways. I could go on and on and on. The possibilities really are endless. For myself, I’m using this to make a list of all the mini goals I want to tackle this year. They’re a mix of personal, home, family, and work. Mostly they’re quick little things I want to do. 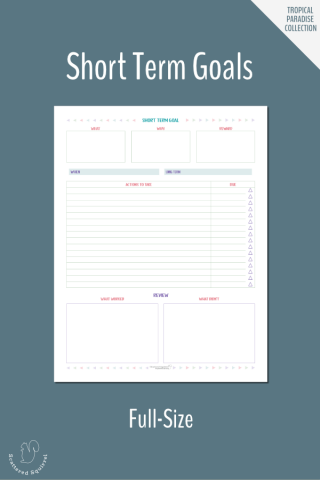 Some of them require a little bit of planning, but the kind of planning they require doesn’t need one of the goal planning worksheets above. Refer to your goal plan often. 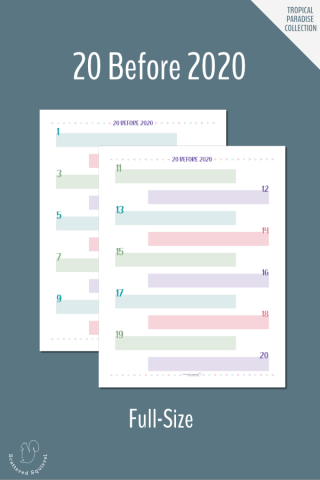 When you sit down to plan your month, week, or day, refer to your goal plan and make sure to schedule in those tasks. Your plan is your road map. It can only lead you to your destination if you follow it. Check tasks off as you complete them so you can see your progress each time you look at it. And don’t be afraid to make changes as you go. Sometimes plans change or the things we need to do to reach our goal change. Your plan is not set in stone. Add to it, change things, delete things as needed. If you haven’t made time to sit and plan your goals, I encourage you to do so. 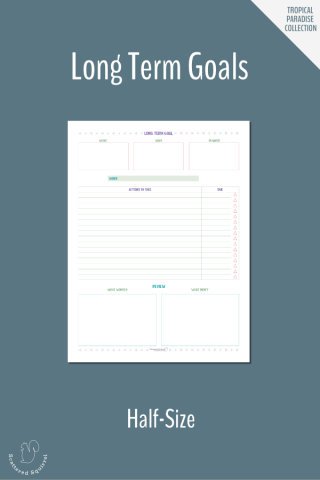 Having them written down and broken down into easy to manage tasks is a great way to achieve them. 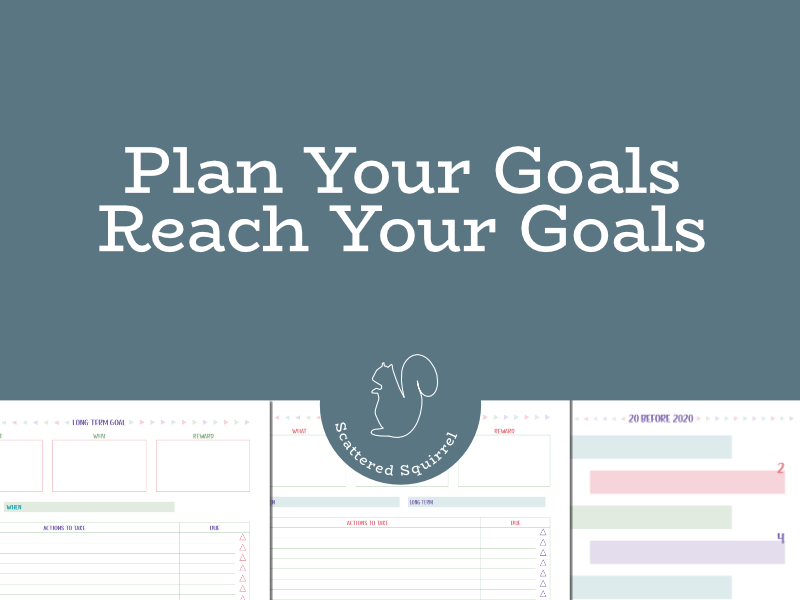 Whether you use the printables, a notebook, or a file on your computer, planning your goals will help you reach your goals. Have you taken time to plan your goals for this year? Drop a line in the comments and let me know.